This morning was too warm for February. We drank coffee and checked email while we waited for the carrier to drop the newspaper in our box. I think we are the only ones on our road that takes the Birmingham News, so I think we are the last drop she makes before heading home to her family. When I opened the door, the dogs almost knocked me down to chase a nearby squirrel from the birdfeeders. It was foggy outside. Halfway down to the paper box, I noticed a spider web in the huckleberry bush by the path. 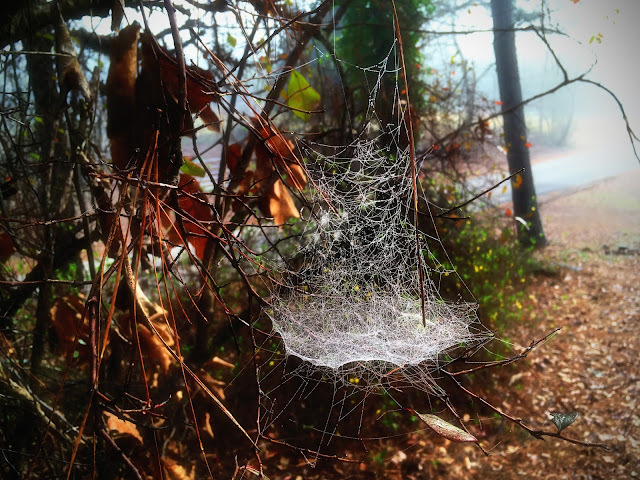 The morning dew had collected on the fragile threads of the web. It looked like a tiny ghost ship sailing across the foliage. Pulling the phone from my pocket, I snapped a few frames. Further down the path, I noticed many more ghost ships in the trees and shrubs all around me. I think we were under some kind of attack. I've been edgy all day. Hope Sunday hasn't been as spooky as ours :) . Yes, that's exactly what that web looks like. Nothing I like better than a good ghost story and with that wonderful pic, it's a winner! It's been scary warm here too. I bet it was 65de yesterday and today. I never thought I would be wishing for cold, but this time of year is way too early for these temps..as lovely as they are! I worry about the fruit trees. Wow that does look like a ship! Quiet lovely actually. Thanks for sharing your little walk. Love those ghost ships! It has warmed up some around here too, just enough to get the snow melting a bit. I had a huge orb spider coming down from the barn ceiling this morning and it was a big one. My helper got freaked out by a huge spider coming down on a web and he hit it with my broom and actually broke the handle. lol. I thought it was very funny. Yeah, it is a pretty picture but my mind with to some TV movie and Doc Holiday, "I'm your Huckleberry!" Boom! I published my blog with a different carrier. I hope it helps, have a great day! You can find beauty in lots of things if you look deeply enough!! Lovely ... from a distance. I'd hate to walk into something like that after dark! PS - Someone recommended getting peppermint oil and add to my 'mister' spray bottle to repel spiders. I'll let you know if it works! Amazing photo! Love it! Great description!! It does look like a ship. I can't resist taking a photograph of a spider web if the light is right. Are you certain they are spider webs? Some other creatures create webs and travel in packs.